Squamous cell carcinoma is a common form of skin cancer. It develops in the thin, flat cells that form the top layer of the skin. It is usually caused by too much exposure to ultraviolet (UV) radiation. This can happen by being outside in the sun, or by using tanning beds. Squamous cell carcinoma usually is found on the face, ears, neck, hands, or arms. It can occur in other areas of the body. A for asymmetry – Mole is not symmetrical. If it was folded in half, the two halves wouldn’t match. B for border –Edges of the mole are blurry or jagged. C for color – Changes in the color of a mole. This could be darkening, loss of color, spreading color, or multiple colors. D for diameter – A mole more than ¼ inch in diameter. E for evolving – Mole looks different from others or is changing in shape, size, or color. a patch of skin that has changed color. If you notice any of these symptoms, or if you have a new mole that looks different from your other moles, see your family doctor right away. Most cases of squamous cell carcinoma are caused by too much exposure to UV radiation. This can come from the sun or from UV lights in tanning beds. Having fair skin, blond or red hair, and light-colored eyes. Long-term sun exposure, such as from working outside. A history of bad sunburns, especially as a child or teenager. Having a weakened immune system, including having an organ transplant. The first step in diagnosing squamous cell carcinoma is regular self-examination. By checking your skin and moles regularly, you become familiar with what is normal for you. Then, if you see something abnormal, you can see your doctor. Your doctor will examine your skin. He or she will look at the size, shape, color, and texture of any concerning areas. 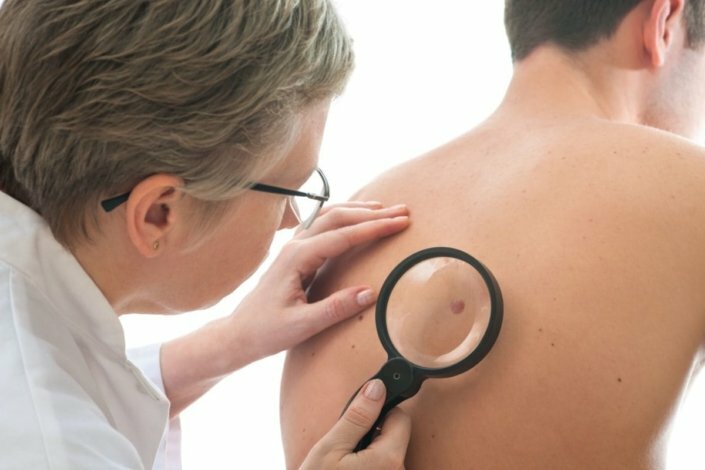 If you have changes that could be skin cancer, your doctor will remove a piece of the affected skin. This is called a biopsy. The piece of skin will be sent to a lab for testing. If skin cancer is diagnosed, you’ll undergo more tests to see if the cancer cells have spread. These tests could include a CT scan, MRI, or lymph node biopsy. Can squamous cell carcinoma be prevented or avoided? Most cases of squamous cell carcinoma can be prevented by avoiding exposure to UV rays. Avoid the sun, especially during peak hours of 10 a.m. to 4 p.m. Wear a wide-brimmed hat, protective clothing, and sunglasses when you go outside. Avoid places that reflect light, such as water, sand, or concrete. Don’t try to get a tan, including using tanning beds or sunlamps. If squamous cell carcinoma is caught early, it is usually easy to treat. Examine your skin once a month. See your family doctor right away if you find anything that looks suspicious. Treatment for squamous cell carcinoma depends on several factors. These include where the cancer is, how big it is, how far it has spread, and your general health. Most cases can be taken care of with a minor surgical procedure or topical treatment. Excision – Cancerous tissue is cut out. Freezing – Cancer cells are frozen with liquid nitrogen. Medicated creams – Topical creams or lotions with anti-cancer medicine are applied directly to the affected skin. Dermabrasion – Cancerous tissue is “sanded” away. Laser therapy – An intense light beam vaporizes cancer cells. Curettage – Surface of the cancer is scraped away, and the base is treated with liquid nitrogen or an electric current to kill remaining cancer cells. Mohs surgery – Cancer is removed and examined layer by layer, preventing the removal of healthy tissue. Radiation – High-energy beams, such as X-rays, kill cancerous cells. Most cases of squamous cell carcinoma can be cured with treatment. How well you do after treatment depends on many things, including how early the cancer was diagnosed. Left untreated, this skin cancer can spread to other parts of the body, including internal organs. This could cause serious health problems. The earlier this skin cancer is found and treated, the better. Some cancers like this can return. If you’ve had skin cancer before, your risk of getting it again is higher. I spent a lot of time in the sun as a child. Am I at higher risk of developing skin cancer? One of my parents had skin cancer. Am I more likely to get it? What should I look for when I do a self-examination of my skin? I have darker skin. Can I still get skin cancer? What can I do to protect my child from the sun? Is there anything I can do to keep the cancer from coming back after treatment?